Popo & Nana's Climbing Challenge is an Event Course in Super Mario Maker, released on May 12, 2016. It is based on the NES title Ice Climber, and unlocks the Popo and Nana Mystery Mushroom costume upon completion. The level begins with many ? Blocks and Brick Blocks, leading to a warp pipe. The next segment consists of Brick Blocks, Goombas, and Koopa Troopas, leading to a Warp Door. The next segment consists of flying cloud platforms, along with a Checkpoint Flag and another Warp Door. 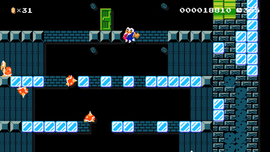 The next segment consists of Ice Blocks, Koopa Troopas, and Spike Tops, with a Warp Door at the end. The next segment consists of conveyor belts and Goombas, with a warp pipe at the end. It leads outside and to the Goal Pole. This page was last edited on November 15, 2018, at 16:43.